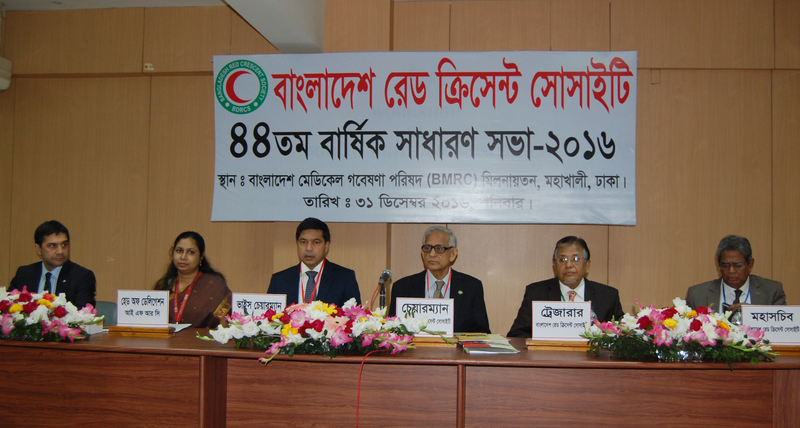 The 44th Annual General Meeting (AGM) of the Bangladesh Red Crescent Society (BDRCS) held today at the Bangladesh Medical Research Council auditorium, Mohakhali, Dhaka. Chairman of BDRCS Mr. Hafiz Ahmed Mazumder presided over the meeting, while Treasurer Advocate Tauhidur Rahman delivered the welcome speech. Vice-chairman Prof. Dr. Md Habibe Millat, MP read out the Message from the Hon’ble President, who is the ex-office President of BDRCS. The inaugural session of the AGM was also addressed by Acting Head of Office, International Federation of Red Cross and Red Crescent Societies (IFRC) Ms. Maliha Ferdous and Head of delegation International Committee of the Red Cross (ICRC) Mr. Ikhtiyar Aslanov. The Head of ICRC and IFRC expressed their satisfaction on the role of BDRCS for serving the distressed and vulnerable people. They assured their continued support and cooperation to implement all humanitarian activities of the BDRCS. The AGM was attended by the only Honorary Member, Vice-chairman, Treasurer and members of the Managing Board, Delegates from BDRCS Units, representatives from respective Ministries (Health and Family Welfare, Disaster Management & Relief, Social Welfare and Defense) and the Secretary General. The AGM endorsed the Audit Report 2015, Resolution of 43rd AGM (2015), Revised budget 2016, Annual budget (Tk. 27,34,564.00) 2017 and Annual Report 2016. The AGM elected the 15 members Managing Board (2017-2019) including Prof. Dr. Md Habibe Millat, MP and Advocate Tauhidur Rahman were elected as Vice chairman and Treasurer respectively. His Excellency President of Bangladesh, Hon’ble Prime Minister and Hon’ble Minister for Health and Family Welfare gave separate messages on the occasion.